Berkeley Commonplace | Collaborative art projects and creative activities for personal, social and civic wellbeing. Collaborative art projects and creative activities for personal, social and civic wellbeing. Fragments, a continuing collaborative global video-installation, will be at the Arnot Art Museum in Elmira, New York, April 6 and 7, 2011. The August 7 screening at Berkeley Commonplace will utilize the photo/video sharing Web site, Flickr, as a source for numerous short movies to be presented in three parts. Each of the three parts will loosely follow the Flickr ‘gallery’ format (up to 18 works), and will, for the most part, abide the Flickr video duration limitation of 90 seconds. This will result in each part having a duration of between 20 and 30 minutes. There will be two intermissions. Following the third part, there will be an ‘open’ screening, in which members of the audience will be given the opportunity to present their own short movies. Many thanks to all who attended the Saturday screenings. Special thanks to the popcorn providers, and to B.S. Wise for the live-online broadcast. Saturdays, June 5 and 12, there will be screenings beginning at 8 p.m. Among the featured films will be a new international collaboration, 2o Twenty No. 1, A Strange Land. Also screening will be three new music videos by San Francisco band, Slowness. Live music and projection, Saturday, April 17, featuring Vishnu’s Secret. The northeast corner is now a theatre space, enclosed by a black curtain, with black walls and ceiling. 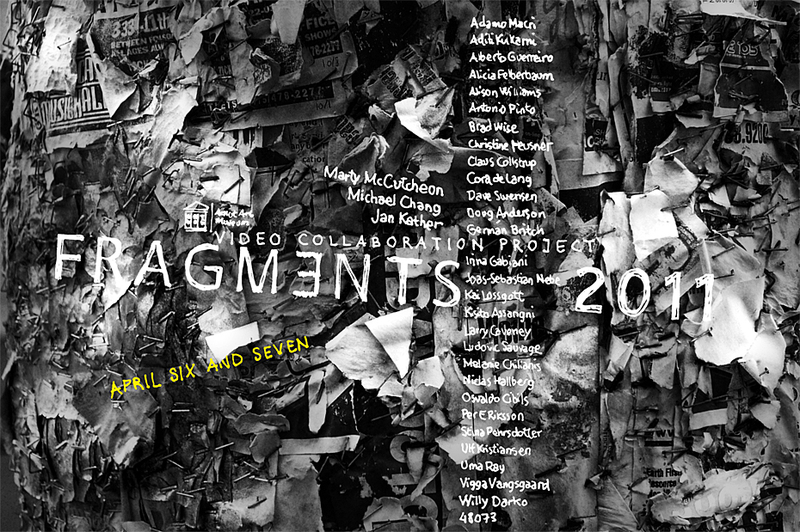 Fragments, an international video collaboration instigated by Michael Chang (Denmark) features contributions by fifteen artists from ten countries. The videos will be projected onto a white, 3D screen built of scraps and junk, measuring approximately 5 x 7 feet (152 x 213 cm). Also featured on the 3D screen will be local cityscape time-lapse movies by B.S. Wise.